The Bow River is an integral part of the Bowness community. Being so close to the river means there will always be a risk of flooding. In Bowness, flooding can happen when the flow rate is approximately 850 cubic metres per second (m3/s). Without upstream mitigation, there is a 12 per cent chance of this occurring each year. 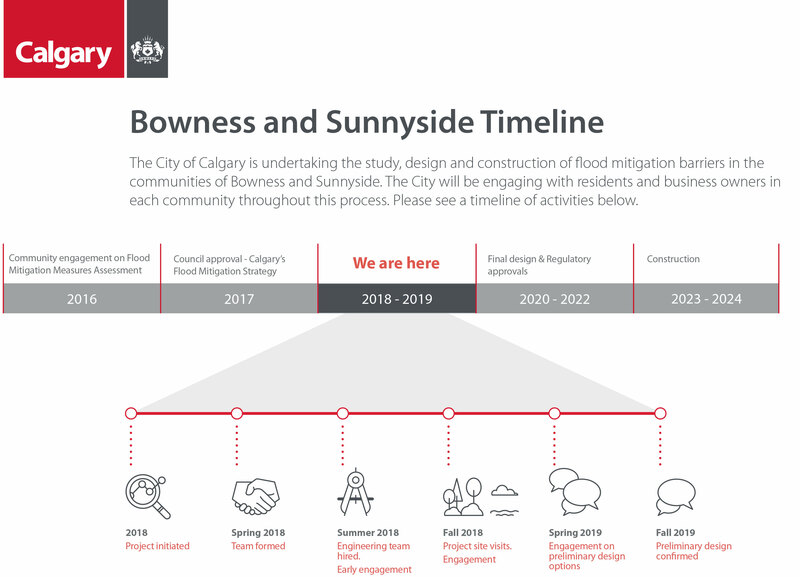 In 2016, The City hired external consultants to update the Provincial Flood Damage Assessment study for Calgary, and to assess and recommend future resiliency and mitigation measures. The resulting document, the Flood Mitigation Measures Assessment (FMMA) report, was approved by Council in spring of 2017. Recommendations include a combination of watershed-, community- and property-level mitigation solutions to create a flexible and adaptable flood risk management program. The Bowness flood barrier project was one of the recommendations from this study. Once a new upstream reservoir is constructed, this project will work in combination with that, as well as changes to operations of TransAlta’s reservoirs, to provide enhanced flood protection for Bowness. The construction of barriers will help to protect Bowness from flood events up to 1,200 m3/s. This flow rate represents a one-in-20-year flood, which there is a five per cent chance of realizing every year. The map below highlights the area of land (purple and yellow area) The City is trying to protect from future flooding. The City is proposing building permanent flood barriers that will extend from the CP Rail tracks to the Shouldice Bridge. This project is still in the early preliminary design stage. The preliminary design phase will span nearly two years, consisting of gathering feedback from community members, conducting site surveys, and completing engineering studies and analysis. Work completed prior to this phase was part of the conceptual design phase. In this phase it was determined that flood barriers are a feasible option for the community, but no details about the barriers are determined and it is based on information available at the time. It's high-level, conceptual work that needs to be validated and refined in preliminary design. In July, The City hired Klohn Crippen Berger Ltd. as the engineering consultant for this project and hired an engagement firm, Context Research Inc., to create a robust public engagement strategy. Conceptual work has been completed, however, detailed design has not yet started. Input from citizens is an important piece of the detailed design process. Engagement with residents began in early 2018 and will be ongoing through to the completion of the project. We recognize that input from you is key to making this project a success. As we kick off the project, we are collecting input on the unique characteristics of the Bowness community that will need to be considered in the design. This information will help to guide the engineers and landscape architects who are working on the preliminary design for the barrier. 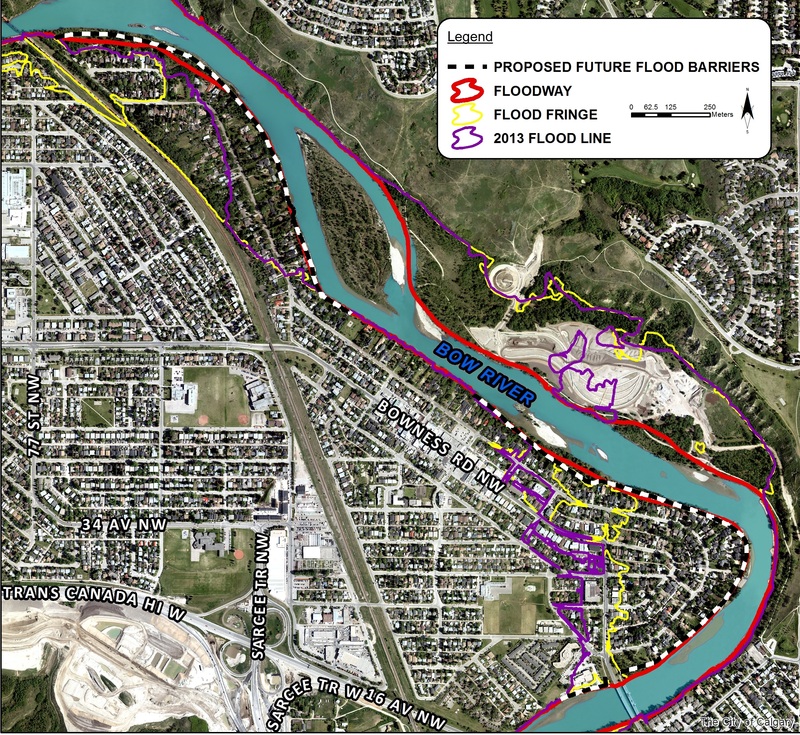 What should The City consider when planning and designing flood mitigation for Bowness? Based on your experiences and thoughts about Bowness, we would like to know what local features and sensitive areas should the project team consider in the design of the barrier. Drag the map around and use the zoom buttons at the top left of the map to find a location or feature you would like to provide a comment for. Click "add marker" and type your comment. Add as many markers as you wish. We hosted a public session to discuss the results of the Flood Mitigation Measures Assessment and gather preliminary feedback on the proposed Bowness Flood Barrier Project. A What We Heard Report from this engagement can be found here. Additional questions brought up at this session were addressed in this report from September 2018. We gave the same presentation to both the Bowness Community Association as well as the Bowness Responsible Flood Mitigation Society. The slide deck can be found here. We gave a presentation to riverfront residents. The slide deck can be found here. Questions asked during this session as well as answers can be found here. An overarching What We Heard Report for the engagement activities in Fall 2018 can be found here. After the close of this phase of engagement, all data collected will be analyzed by The City and summarized in a What We Heard Report that will be shared with the community. Further engagement is underway through 2019 with river-front property owners and community members. We will share details of these plans on this page as they are available. Check back here for updates.